Forget Ridley Scott’s Alien. There’s a new, real-life horror story in space. As one national newspaper headline warned this week, the International Space Station is ‘filled with germs’. But should such a revelation really make us scream? The story stems from a new NASA study (reported in Microbiome) which found that some bacterial pathogens, including Actinobacteria – often associated with human skin – are thriving in the station, 248 miles above the Earth. Not that this is necessarily a bad thing. A more level-headed microbiological newspaper under my editorship would have tweaked the headline to read ‘Microbiologists not surprised that the International Space Station is filled with microorganisms’. For it’s time to get something straight. The press tends to think that all bacteria are germs. But they are not. Germs are synonymous with disease, but the majority of bacteria do not cause disease, they are essential to life on earth, driving nutrient cycles and preventing elements and nutrients from being permanently locked up and unavailable. Without bacteria, the Earth would not properly function and we’d become a barren planet. Now that is a horror story. Microbes (bacteria, viruses, fungi and protozoa) are everywhere – and in large numbers. They show wide diversity, and thrive where it is hospitable while colonising areas we would not think possible, such as hot springs, in the middle of salt crystal and at the bottom of the deepest oceans. The human body carries 20 times more bacterial cells than human cells, and we, like the environment, would suffer if we were microbiologically sterile. Bacteria in our guts process food, protect us from invasive germs and also challenge and boost our immune systems, making them stronger. As you descend a subway escalator, just run you finger along the surfaces. That black grime is mainly human cells and associated bacteria. Humans shed millions of cells a day. Indeed, trailing dogs follow specific human scents laid down by shed skin cells in the environment. Just consider that a fully-clothed person can lay down enough cells for a dog to track them more than 72 hours later. But what’s this go to do with ISS and NASA? Well, let’s just say that no microbiologist would be surprised or alarmed to hear that NASA has found the ISS to be filled with microbes (including a few “germs” or bacteria that cause disease). It is an enclosed unit, it has oxygen, and it is filled with people who are shedding skin and bacteria. They also have to perform bodily functions and, even in a perfect world, toilet habits are less than spotless. Faecal material, which also carries large numbers of bacteria, may be introduced. Dinnertime. Have you washed your hands? So the personnel on ISS are likely the main source of contamination although some bacteria may have been introduced as far back as the construction of sections back on Earth. After all, the ISS, like other spacecraft, is a closed community. Nothing blows in through the window – if it did, bacteria would be the least of the crew’s worries – and this environment only changes occasionally during the infrequent personnel changes, when new astronauts bring aboard their own distinct microbial communities. NASA seeks to better understand this and how it might affect future missions. So should the astronauts spend a little more time cleaning? Doing a little vacuuming? A bit of dusting and polishing? Well, they probably do that anyway. Their air is filtered and there are few reports of infections afflicting the crew. Despite the headlines that conjure up a picture of a soup of bacteria filling the ISS, infection among the crew is relatively rare. A comparison over a three-year period showed that a high proportion of medical events were physical problems. Space adaptation syndrome and nervous system problems accounted for 50% of all the medical events with infectious disease accounting for only 1.4% of such issues. Astronauts further reduce the possibility of infection through periods of quarantine prior to their mission. NASA is rightly concerned that infections could be transmitted to all in such a closed environment. 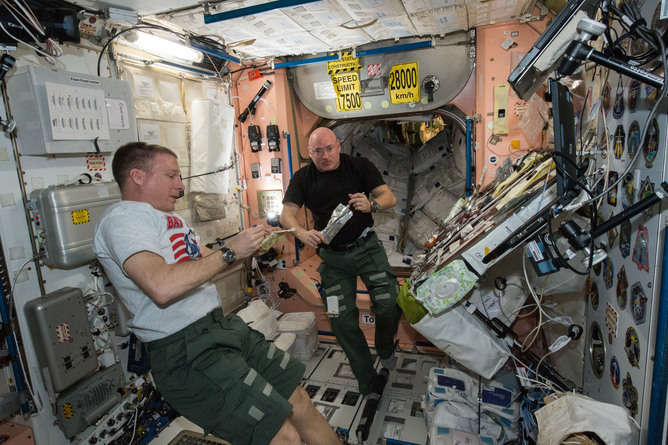 This NASA study is an important piece of research because it relates to understanding the factors that ensure the disease-free status and well-being of current and future ISS crews, where help is not immediately at hand and prevention is better than a cure. Infectious disease is only one of the medical factors that can affect the astronauts’ health as they have other non-microbiological influences to contend with. Indeed, for them, living with microbes is likely just another much-needed reminder of home. However, coming home, with their immune systems optimised to the ISS microbial environment might possibly leave them more susceptible to challenges posed by exposure to the wider range of infectious agents on Earth.